On February 2, 2011, when rescuers from UAN, The Humane Society of the United States (HSUS) and Marshall County Sheriff’s Department arrived on scene they found 98 dogs, mostly poodles and other small breeds, living crowded amongst their own feces in small wire enclosures. United Animal Nations (UAN) has deployed volunteers from four states to rescue and care for nearly 100 dogs living in unsanitary conditions without proper socialization and medical care from a Lewisburg, Tenn. property. All of the animals have been surrendered by the owner to the custody of the Marshall County Sheriff's Department. This case began when an anonymous tipper contacted the sheriff about the welfare of the dogs. The Tennessee Department of Health’s Animal Welfare Division also found violations of cruelty laws at the facility during a routine inspection. When rescuers from UAN, The Humane Society of the United States (HSUS) and Marshall County Sheriff’s Department arrived on scene this morning they found 98 dogs, mostly poodles and other small breeds, living crowded amongst their own feces in small wire enclosures. 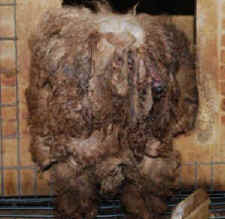 One of the rescued puppy mill dogs was so badly matted, he wasn't recognizable as a living thing, let alone a dog. The UAN volunteers called him Bob Marley. After a bath, a serious haircut and some TLC, Bob was singing a much happier tune. All of the animals are being safely removed and transported to an emergency shelter where they will be examined by a team of veterinarians and receive any necessary immediate medical care. United Animal Nations and The HSUS will assist with the daily care of the animals until they are transported to partner shelters for evaluation and adoption. PetSmart Charities Emergency Relief Waggin' program donated supplies to the sheltering effort. "These animals were not getting the veterinary care or attention they needed to be happy and healthy, as is typically the case in these mass breeding operations," said UAN Emergency Services Manager Janell Matthies, who traveled from California to manage the temporary shelter for the rescued dogs. "UAN volunteers are trained to provide critical support in such cases and will give these animals kind human contact for the first time in their lives and prepare them for a better life in loving new homes." Distinguished by their red shirts, UAN volunteers are specially trained to care for animals at temporary shelters after they have been rescued from cruelty and neglect situations or displaced by natural disasters. Twelve UAN volunteers have traveled from Tennessee, Kentucky, Georgia and California to care for the animals at the temporary shelter, and five more will arrive over the next few days. UAN has nearly 3,000 active volunteers in the United States and Canada, including 73 in Tennessee, and provides its services free of charge to the community. This is the third time in 15 months that UAN has deployed volunteers to care for animals rescued from cruelty situations in Tennessee. In April, 2010, UAN sent 18 volunteers to care for more than 200 neglected dogs in Sparta. In November 2009, UAN sent more than 50 volunteers to Nashville to care for 84 horses who had been rescued from near starvation in Cannon County. In the last two years, UAN volunteers sheltered and cared for approximately 2,925 animals rescued from twelve puppy mills in the U.S. and Canada. A puppy mill is a large-scale breeding operation where animals are housed in unlawful conditions without proper food, water, socialization and veterinary care. 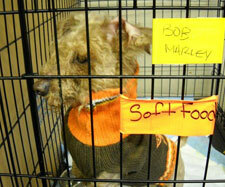 Dogs bred in puppy mills are typically sold at pet stores, through classified advertisements and over the Internet.